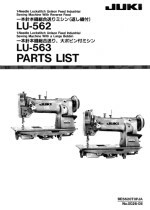 LU562 Standard Hook and LU563 Large Hook Walking Foot Compound Feed Lockstitch Machines. Quality Built Heavy Duty Machine. Need a Part For Your JUKI LU562 or LU563 Machine ? We know this machine, so whatever you need for your JUKI, just give us a call and we'll be delighted to help. S32 Single Piping Set Sizes 1/8. 3/16, 1/4, 3/8 & 1/2"
S95 Double Piping Set Sizes 3/16 & 1/4"